Ordering Original Fine Art or Fine Art Reproductions by John O'Keefe Jr.
O'Keefe Arts works directly with printing and photography businesses and is thus able to ensure consistent, high-quality reproductions. All original artworks and paintings are photographed using state of the art scanning equipment and digital cameras. The captured digital images are professionally processed resulting in High-Quality Giclee Reproductions that are incredibly accurate copies of the original works of art. Working directly with the printer and photographer, John oversees, provides direction, and approves all work performed during the initial development and setup processes of each reproduction. As a final step John personally reviews, assembles, signs and numbers each of his reproductions. Included with each Giclee is an official, signed and numbered Certificate of Authenticity. O'Keefe Arts is continually looking at advancements and upgrades in printing technology and availability. Our reproduction information pages will show updates as we continue to keep current with the latest printing equipment and materials that become available. Customer satisfaction is essential to us and to assure your experience with us meets that goal, we have developed the following procedure to facilitate a positive ordering experience. O'Keefe Arts will generate an Estimate verifying the merchandise, shipping costs and lead times discussed and will forward the Estimate to the customer via Email for the Customer's review and verification of accuracy. O'Keefe Arts will send a Credit Card Authorization / Return Policy form that the Customer must review, sign and return to O'Keefe Arts via Fax (1-855­-207-6152) or email. 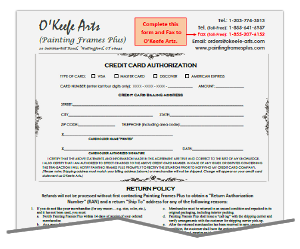 Once O'Keefe Arts receives the signed Credit Card Authorization / Return Policy form, payment information will be obtained and processed to complete the purchase order. O'Keefe Arts will take credit card information over the phone, and process the order after payment has been authorized by the credit card company. IMPORTANT: Refunds can be credited directly to credit card if payment method 1 is used. O'Keefe Arts will email an invoice to the customer that has an embedded link to a secure payment website and the customer can personally enter his/her credit card or direct deposit information and print a copy of the sales receipt. After the credit card payment has been authorized by the credit card company or the direct deposit funds have been transferred, O'Keefe Arts will receive an automated notification and will then process the order. IMPORTANT: Refunds will be paid by check! Refunds cannot be credited directly to credit card if payment method 2 is used. We gladly accept American Express, Discover, VISA, Mastercard and Direct Deposit Electronic Bank Transfers at the time of sale. For orders over $3,000.00, we only accept Direct Deposit Electronic Bank Transfers. The name "O'Keefe Arts" will appear on your credit card and/or bank statements. PCI DSS is the Payment Card Industry Data Security Standard (also referred to as PCI). PCI DSS is a standard created by the payment card companies (AMEX, Discover, MasterCard, and Visa) to help ensure the safe handling of card-holder data throughout the payments chain. Before accepting payment by phone we require that you fill out and sign our Credit Card Authorization / Return Policy form. Most orders will ship via United Parcel Service (UPS) Ground. Special deliveries shall be charged at the full rate. Additional charges may apply for shipments to Hawaii, Alaska and/or Canada. Standard deliveries are done Monday through Friday. Special rates will apply for Saturday delivery. No deliveries are made on Sunday. Canadian orders are subject to Customs fees and duties. 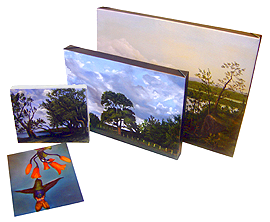 Notify O'Keefe Arts within 14 days of receipt of your ordered merchandise. As a specialty item, there is a 25% restocking fee for all such returns. Customer is responsible for return shipping and all associated shipping fees. Merchandise must be returned in an unused condition and repacked in its original packaging, including interior packing. After the merchandise has been received and inspected, a refund will be issued, less the 25% restocking fee. Please note, refunds are issued if the merchandise is returned in new condition, has not been used, and is suitable for restocking. No returns/refunds will be processed for "custom" cut frames. Notify O'Keefe Arts within 48 hours of receipt of your ordered merchandise. O'Keefe Arts shall issue a "call tag" with the shipping carrier and verify arrangements with the customer for shipping carrier pick-up. After we have verified the returned defective merchandise, the customer shall have the option to either receive a full payment refund, receive an identical replacement item, or select a different replacement item of equal value. After we have verified the returned merchandise, the customer shall have the option to either receive a full payment refund, receive the correct item, or select a different replacement item of equal value. If there is any visible physical damage to the packaging, be sure to have the carrier acknowledge the physical defect before you sign for and take possession of the package and have him/her document the damaged condition of the packaging directly on the paperwork that you will be asked to sign. Failure to do so may jeopardize any future claim with the shipping carrier. Some carriers may permit you first to examine questionable merchandise before signing for it to rule out that suspected shipping damage has occurred. If the shipping carrier refuses to agree to this, DO NOT ACCEPT THE PACKAGE and DO NOT SIGN FOR IT. (The carrier will return the package to the sender.) IMPORTANT: If you open the package the shipping carrier will not be able to send the shipment directly back to the sender. At this point, if visible physical damage is present on the merchandise, you must have the shipping carrier document the damaged condition directly on the paperwork that you will be asked to sign. This documentation will be used for claim submittal with the shipping carrier company. Notify O'Keefe Arts within 48 hours of receipt or rejection of your ordered merchandise, to assist us with any claim process that is required and to be advised regarding the replacement of merchandise.